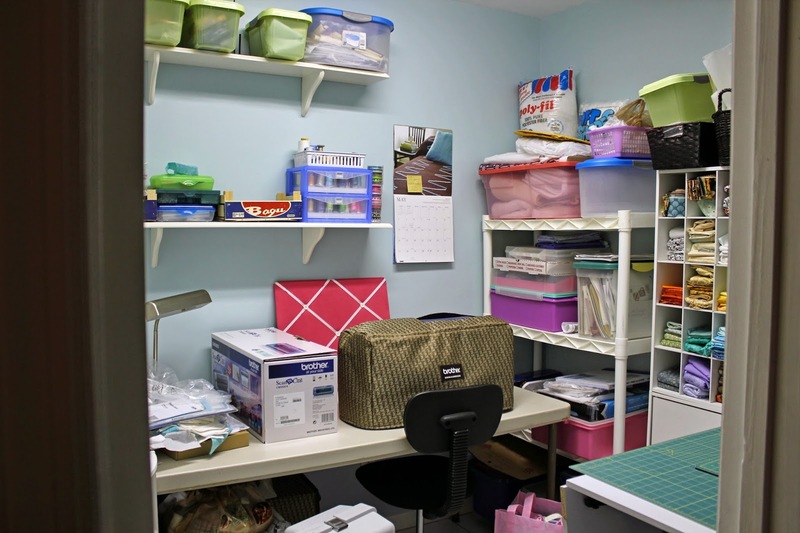 Summer Organizing Series: It's a Wrap! 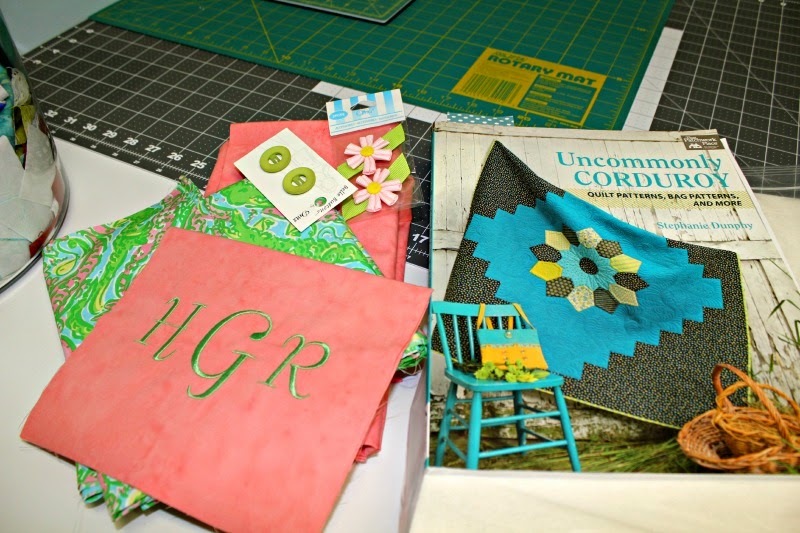 Many thanks to Sherri at A Quilting Life for hosting this productive and fun series. 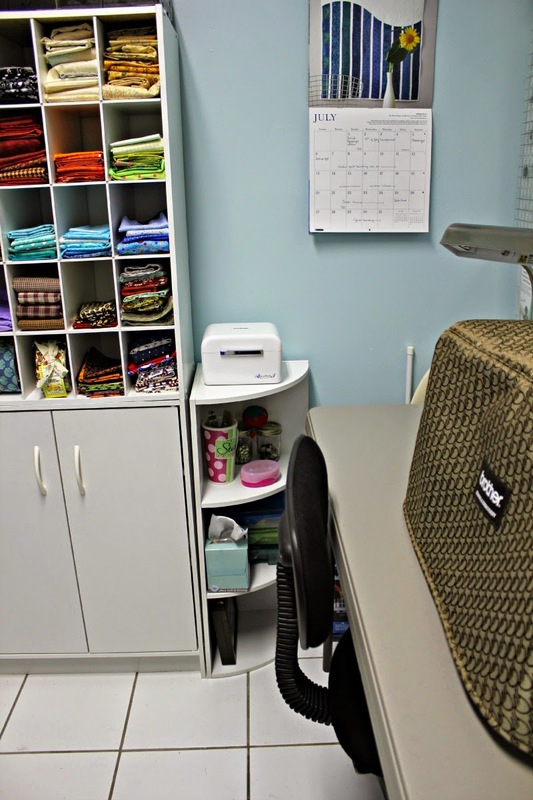 The time it took to go through everything in my sewing room and organize it was time well spent. 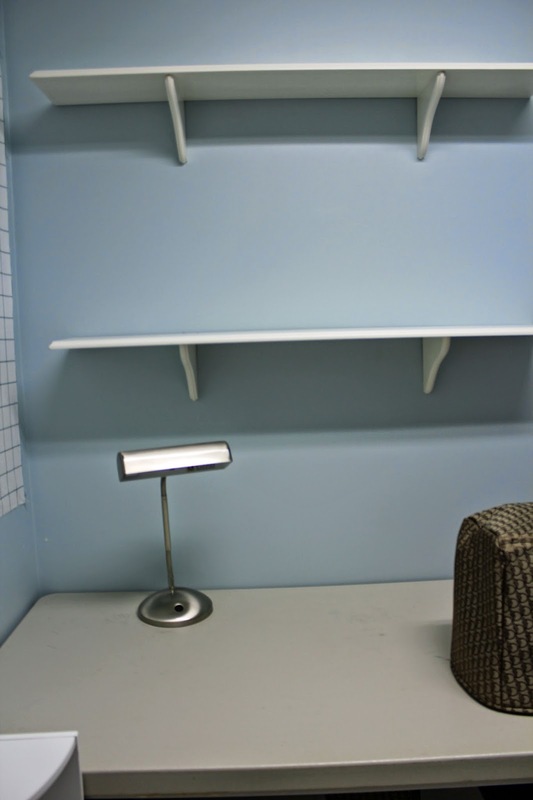 I possess very few of the above in hard copy but what I do have was placed in these handy banker’s boxes and binders. The embroidery designs that I have on CDs are stored in this little box. This is easy. 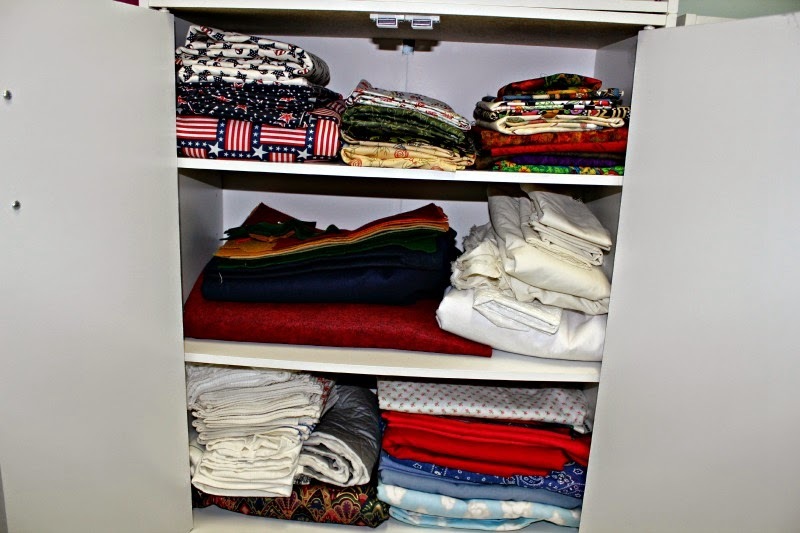 If it is a table runner or topper then it is kept in a drawer in my china cabinet. 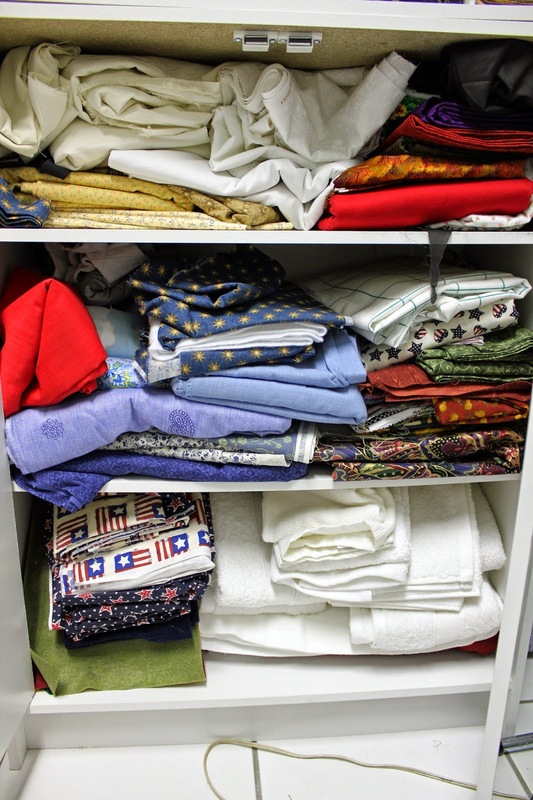 Larger quilts are kept in a linen closet (you really do not want to see a picture of that right now). 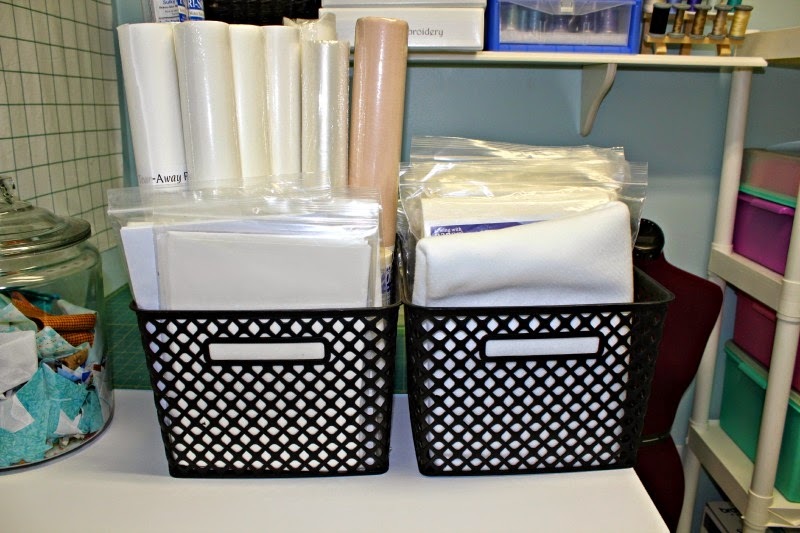 The only items I needed were the bins I bought at Walmart to store stabilizers and supplies for making bags. Here we were to re-evaluate what would stay, what would go and also the lists we made on Day 2. Well, I’m keeping everything…even those rulers that I do not know what to do with. However, I did make a plan. I ‘calendared’ projects to be done, leaving myself the weekends for something new. I changed my mind about keeping zippers in the little wooden box. 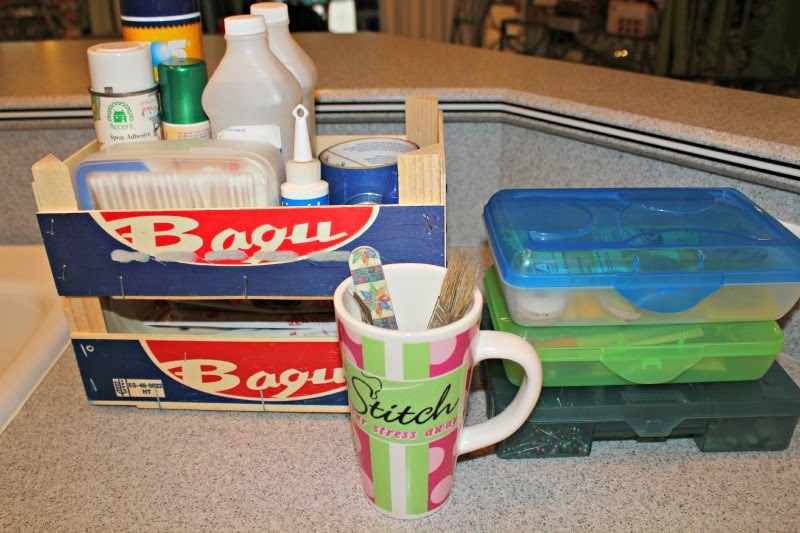 I took those and other notions that I do not use very often and organized those in a large Tupperware container. I simply ‘prioritized’ my list. 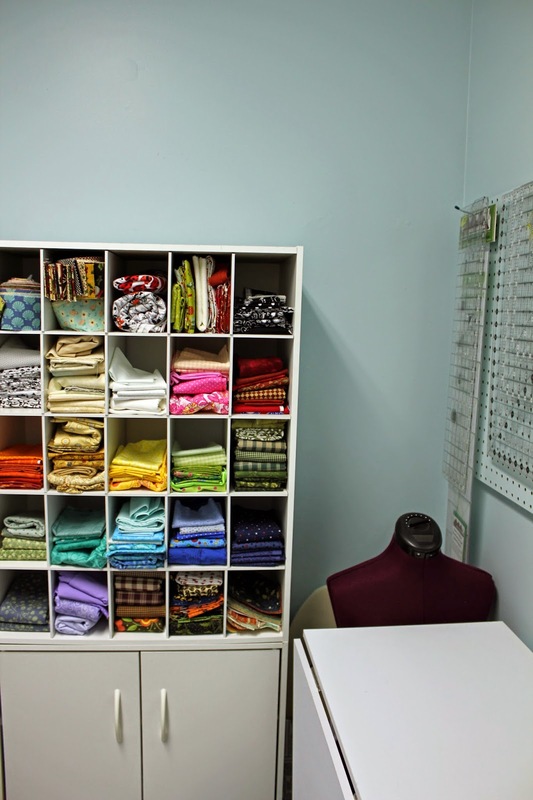 Sherri, A Quilting Life, is hosting a great summer organizing series and this week’s task was to tackle our fabric. I do not have a huge ‘stash’ like many of my blog friends so this was a fairly easy one for me. This is where we decide what to keep, trash, sell or donate. 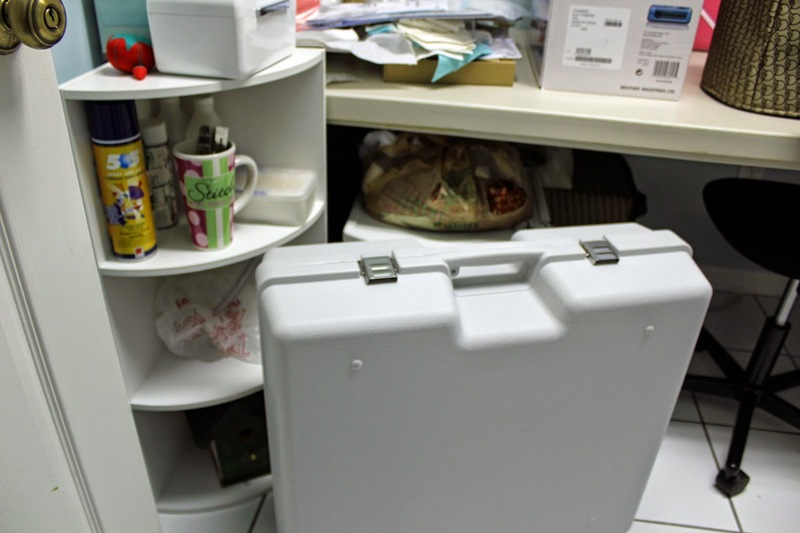 We also placed our unorganized scraps into bins and inventoried our storage options. 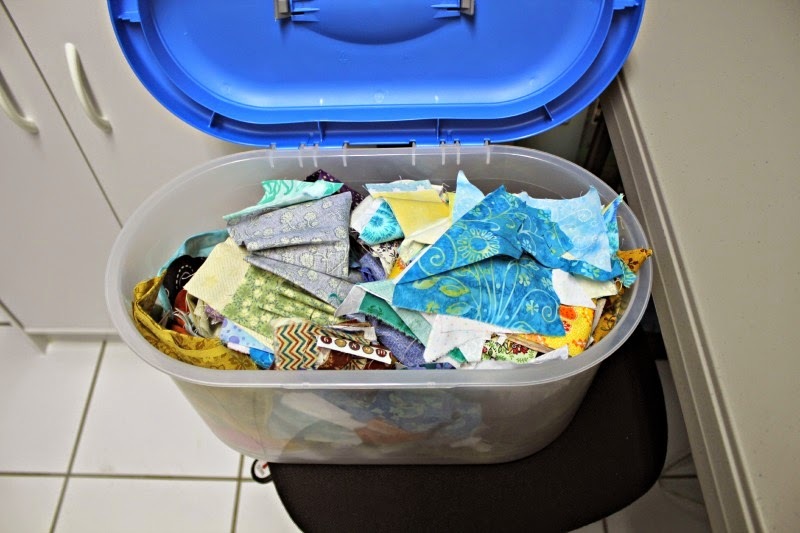 I had already ‘purged’ fabric I no longer wanted or needed a while ago so all I had to do for this step was collect the scraps and better organize by ‘groups’ from Day 7. 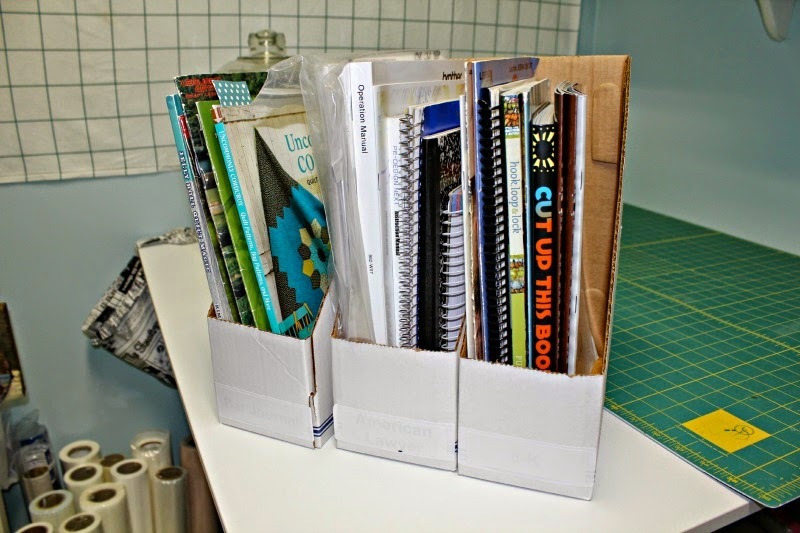 I kept only scraps that I think I will cut into smaller, usable pieces. Everything else went into the trash. Everything has a spot except yardage. 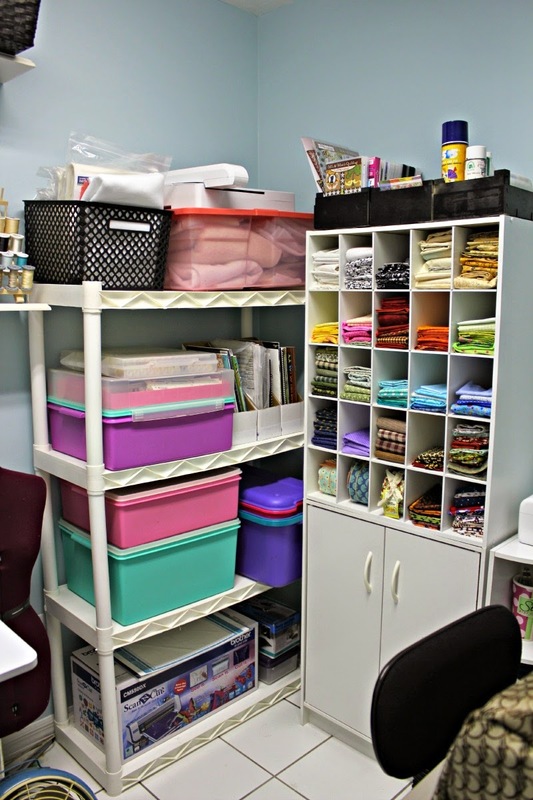 I have to get clear storage bins for that fabric so in the meantime, it sits on top of the fabric cabinet. 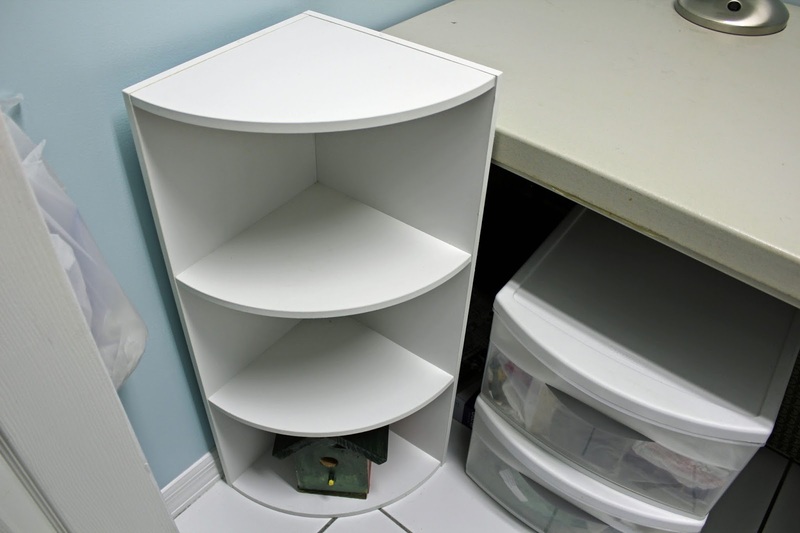 Pre-cuts and smaller pieces fit inside the little cubbies. 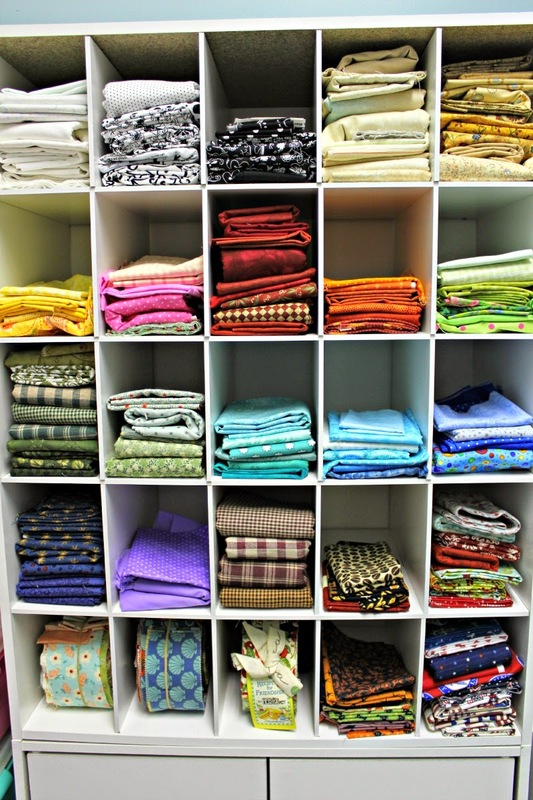 Seasonal yardage, felt, wool, backing and garment fabrics are stored in the bottom of the cabinet. 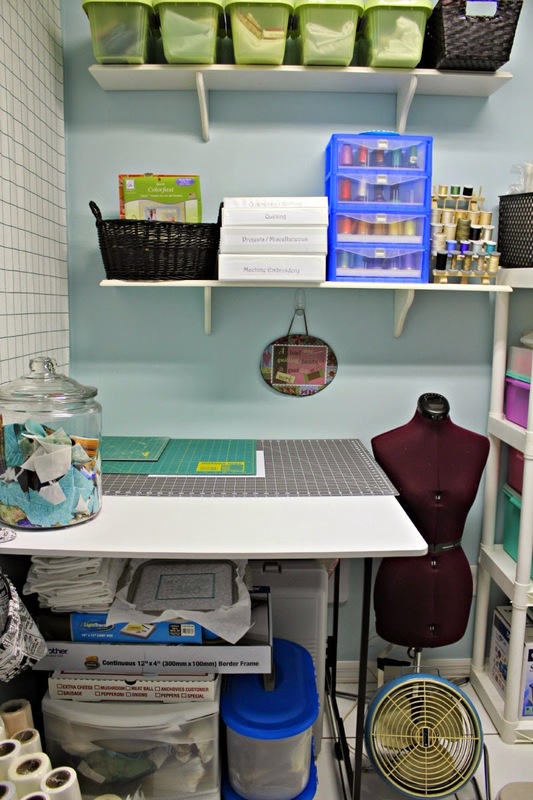 I look forward to having a REAL room for my sewing space one day. I could use my son’s room but I just do not have the heart to make that change… not sure I ever will. 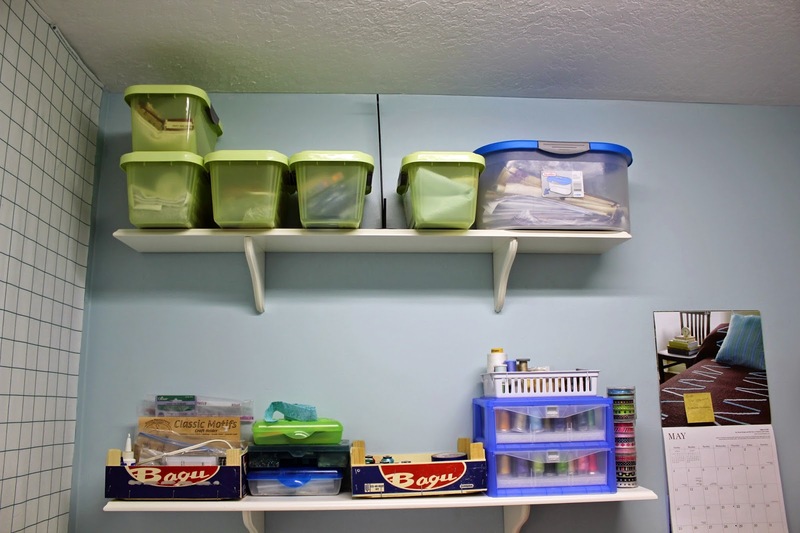 Sherri’s Summer Organizing Series over at AQuilting Life is well under way. 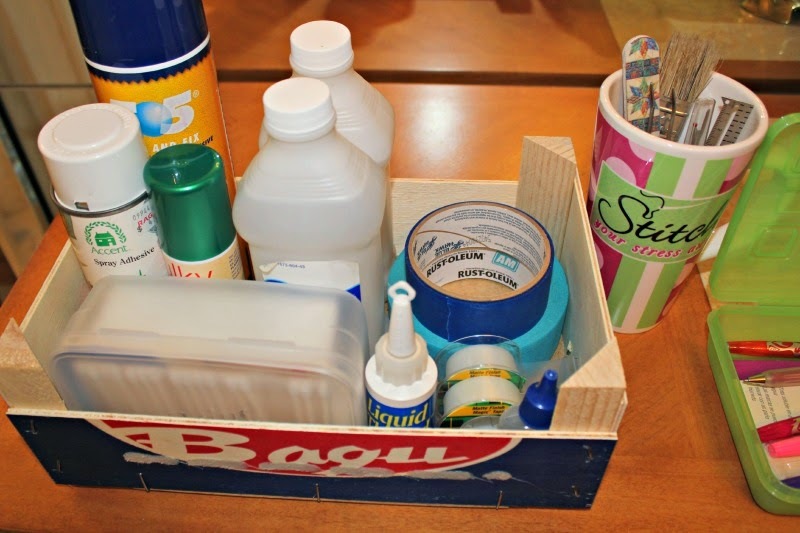 I only pulled the items that I used the most and organized those such that they can be placed in easy to reach places…I’ll save some words and just show you the finished photos for this task. 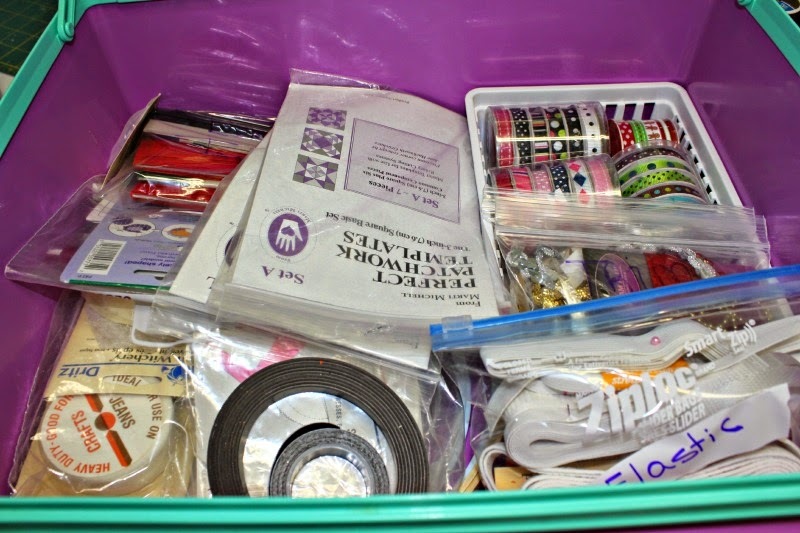 I have TONS more notions that will be organized by type and then bagged or boxed and stored in a large Tupperware container. I’ll show you what I am talking about when the room is back in order. I mentioned last week that I had received some mail and I’d like to share it with you know. Do you know Gene Black? He is an artist, quilter (sews other things as well) and weaver. His creativity goes beyond my wildest dreams. Oh, and he happens to live in my home state of Alabama. 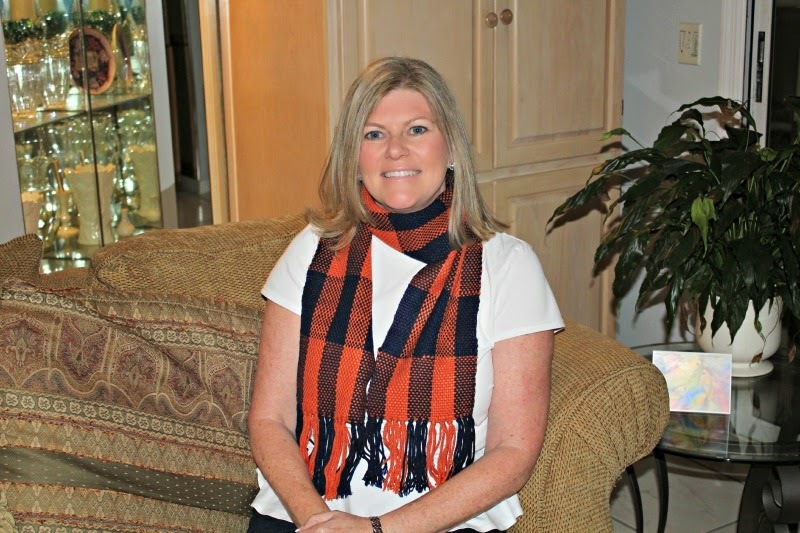 Gene made it so it is very light weight and I can wear it here in South Florida. Even though college football is a fall sport, we do not enjoy that change in weather here. THANK YOU GENE….YOU ALREADY KNOW I LOVE IT!!! 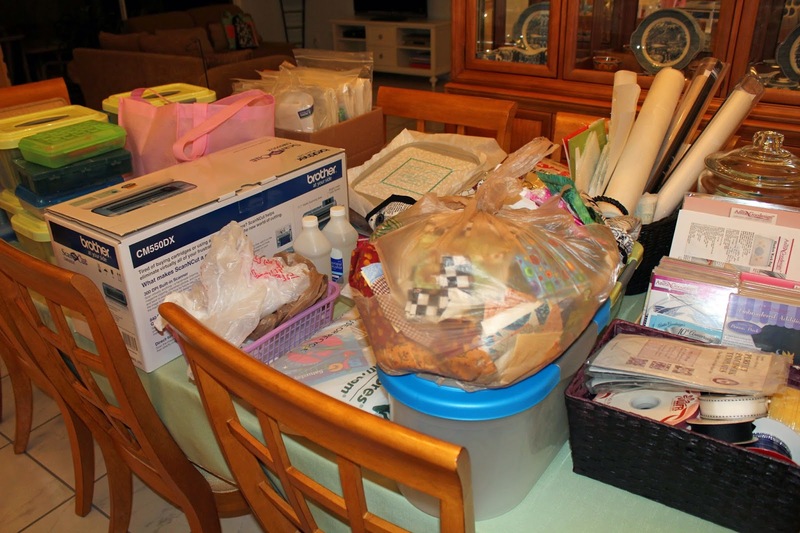 Our dear friend Sinta at a Pink Pincushion sold her home and is getting ready to move. 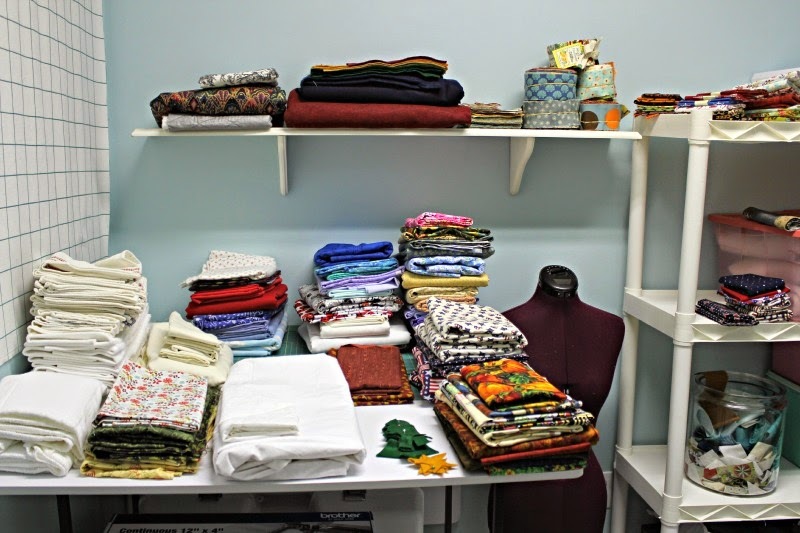 (How exciting… a new sewing room and all) In her packing up she uncovered some lovely vintage aprons. Even though I did not win one of her giveaways, she kindly sent me one anyway. Love her to pieces! 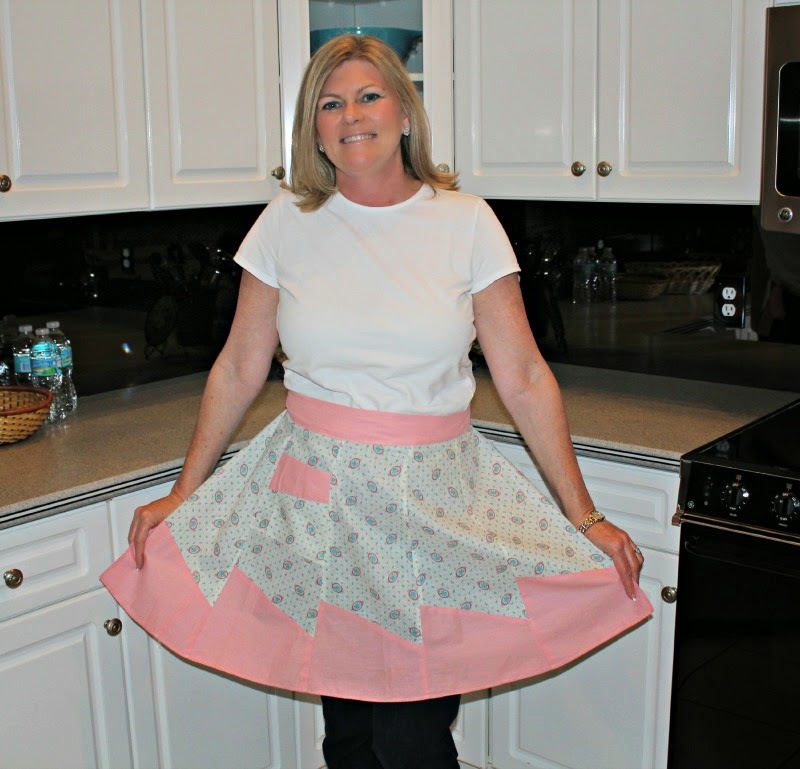 Check out this cute pink and white apron. Thank you so much Sinta, I am honored and I absolutely adore this treasure. 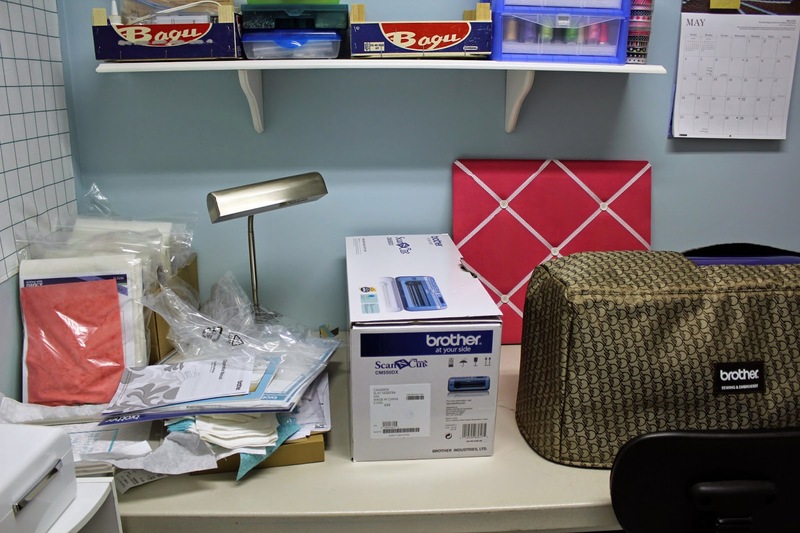 I’m still waiting for Sherri’s next assignment so check back later for more organizing progress. 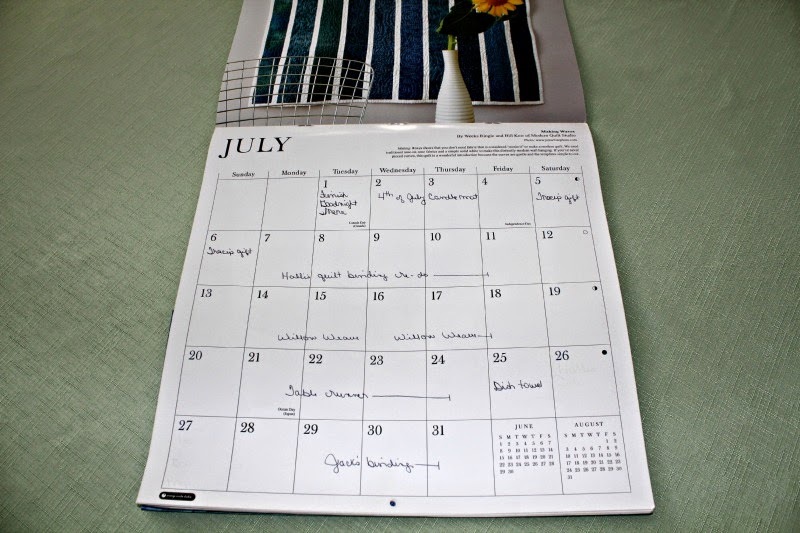 Today I am reporting my results for Day Five of Sherri’s Summer Organizing Series. 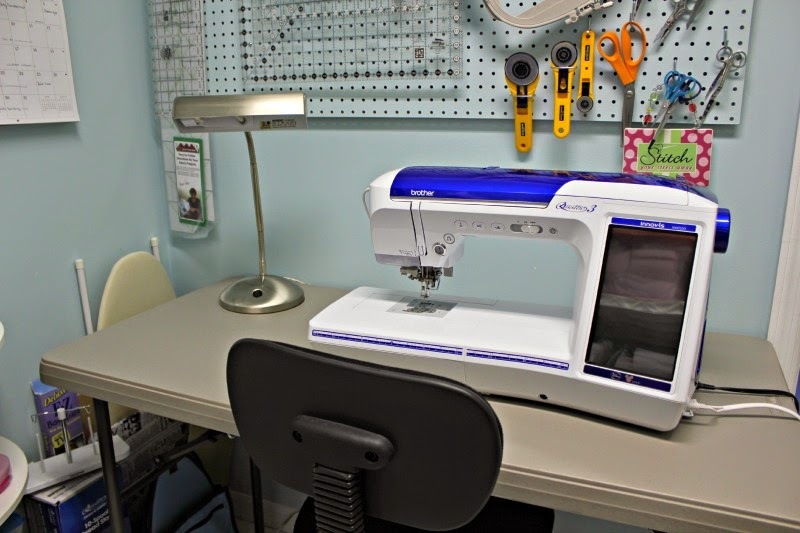 If you click the button on my sidebar “Ready, Set Sew….” it will take you to Sherri’s post for an explanation of the series. 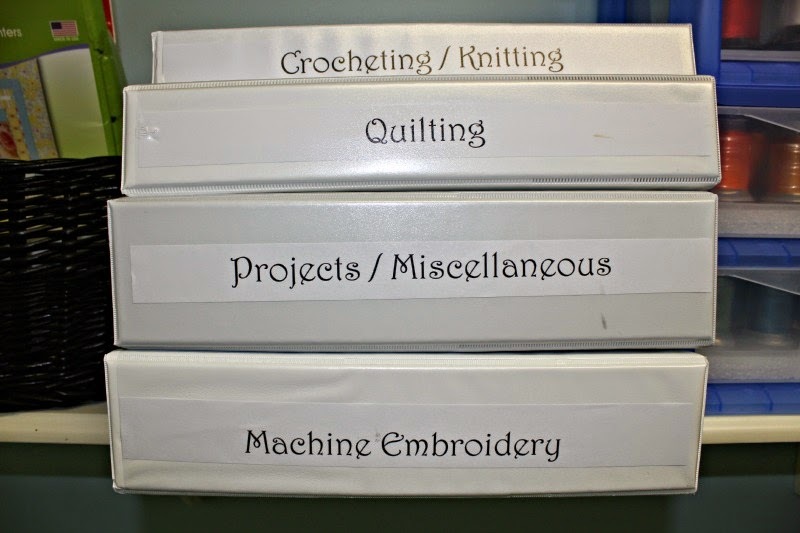 Most of my thread is for machine embroidery, there is also some piecing, quilting and silk thread which I like to use to hand-stitch bindings to the back of my quilts. 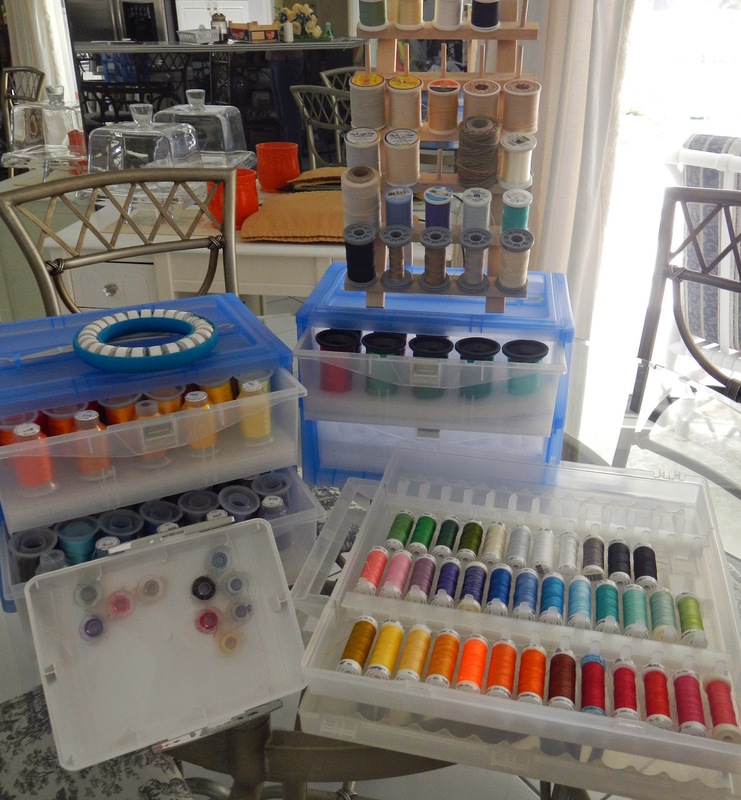 The machine embroidery threads went into the blue boxes and smaller spools are stored in the clear box, bottom left of the photo above. 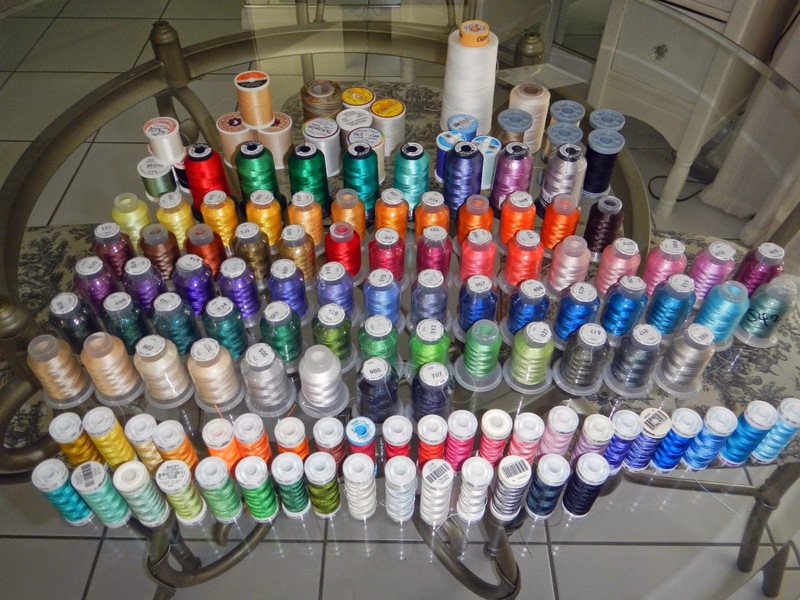 The remaining threads went onto a small wood spool holder. 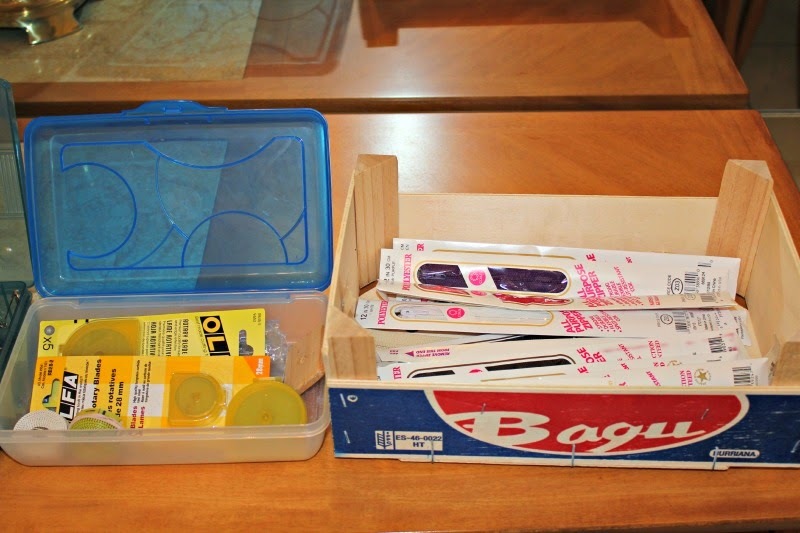 Pre-wound bobbins for machine embroidery are stored in one of those little donut holders. 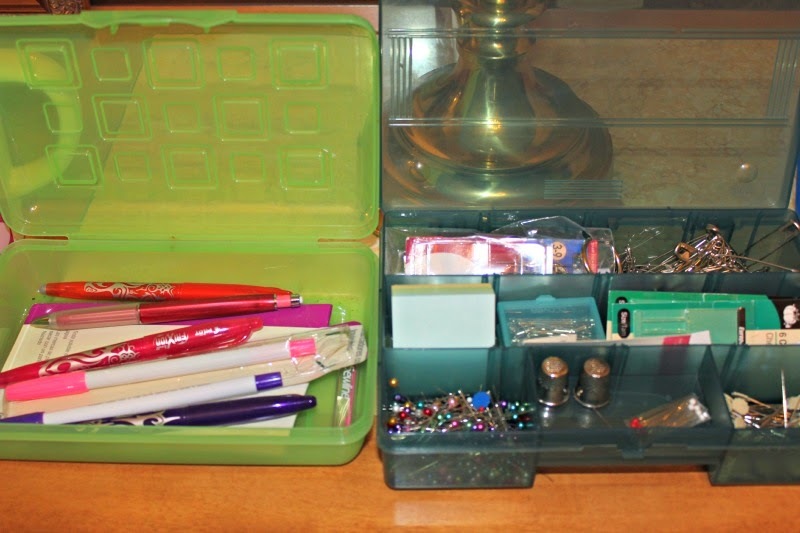 My sewing bobbins fit into little plastic clips inside the lid of my sewing box. Very simple task which left me a lot of time this weekend to run errands and exercise (which is something I desperately need). My DH and I rode our bikes this morning...to the bakery (coffee and danish...yes, please!). If you follow me on instagram you can see the picture there. To make up for it, we rode quite a distance again after dinner. Thanks for popping in...enjoy your week ahead! In this step we are to exam these tools; Do we have what we need? Do we have too many? Does anything need repair? Do the scissors need sharpening? Do we have extra rotary cutter blades? 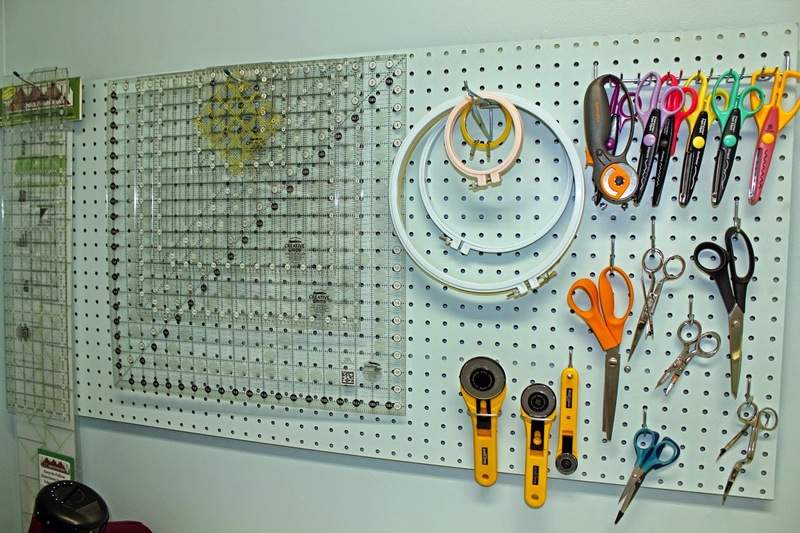 Do we need a new storage solution for these tools? 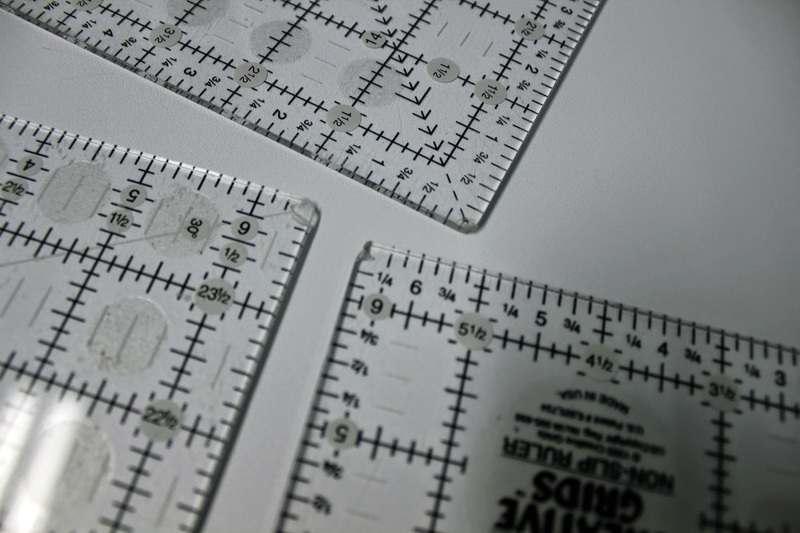 My 6 1/2" square, 15 1/2" square and my 6 1/2" x 24 1/2" rulers all have chipped corners. (Sorry for the bad picture but as you probably noticed from previous photos, I do not have any natural light in my sewing space) I've added these to my shopping list. Then I found a couple of rulers that I have NEVER used. I bought these at a great discount when our LQS was going of business. I thought I would give them a try...but I haven't. Hmmm, what to do with those? 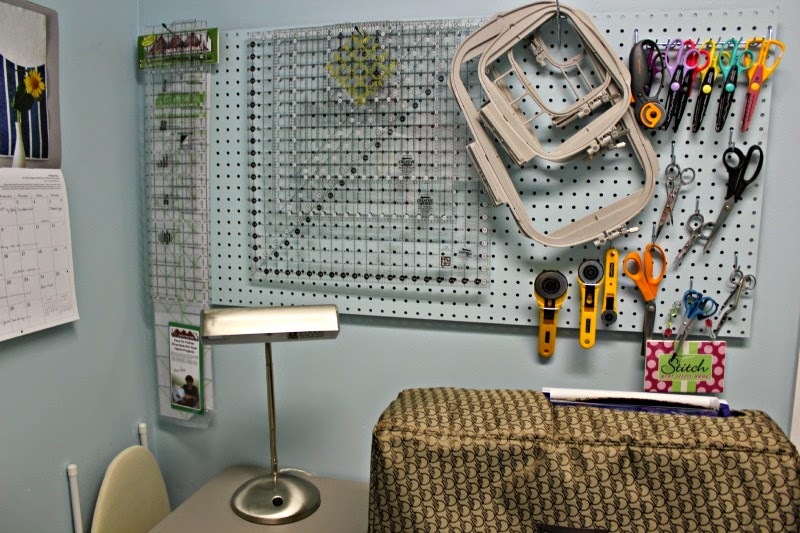 As for storage, I know a lot of people do not care for peg boards but it works in my small space. 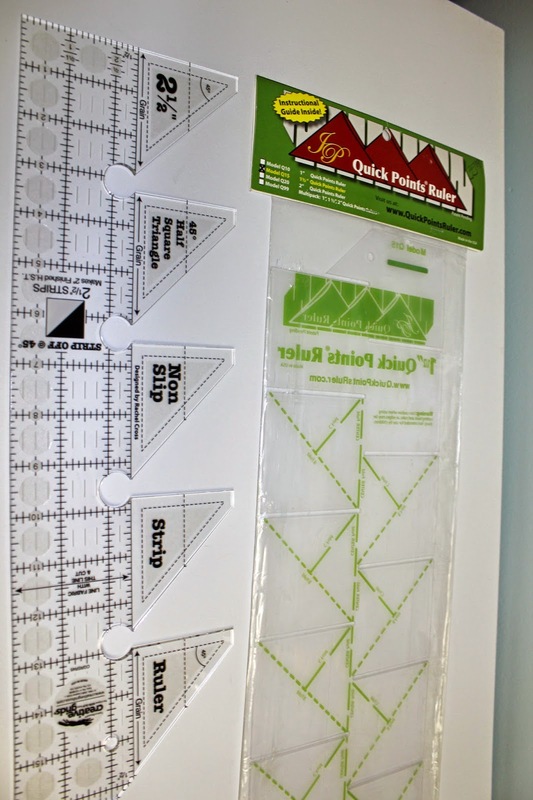 My rulers, scissors and rotary cutters are out of the way but still quite handy. And there you have days 3 and 4. I've added Sherri's button to my sidebar. If you click on it, you will be directed to her first post regarding this series. She will then add links to that post for each added topic. Have a wonderful weekend, you know what I'll be doing! 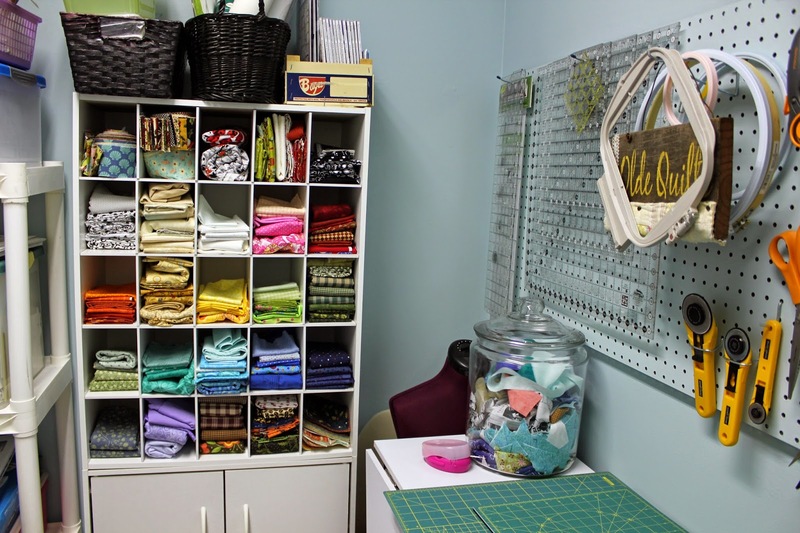 Sherri of A Quilting Life has initiated “Ready, Set, Sew: 20 days of Tips and Resources for a More Organized Quilting Life.” Sherri will give us tasks to perform during the week that will get us organized such that we can sew (wow! actually sew) on the weekend. Please click here to read more about her plan and structure for the program. I decided to participate and then share my progress with you. 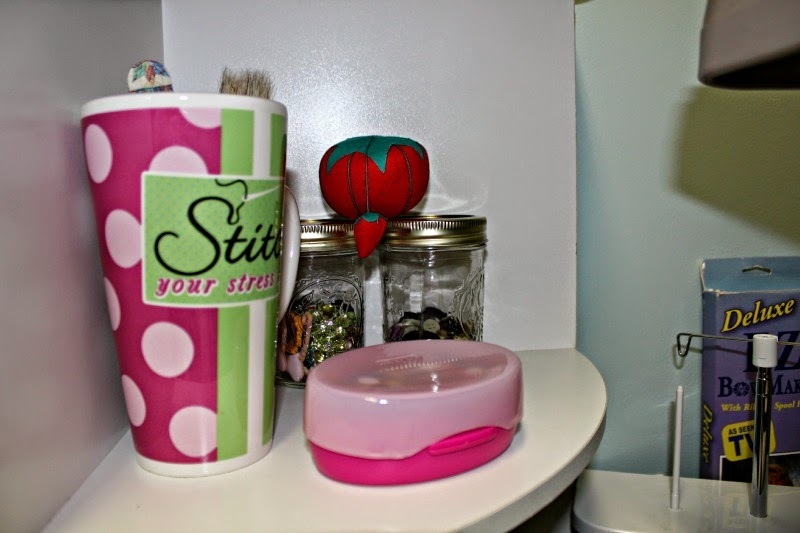 Sherri will be posting tasks on Mondays, Wednesdays and Fridays so I plan to post on Wednesday, Friday and Sunday. Is it bad that it took more than one photo to capture my mess? 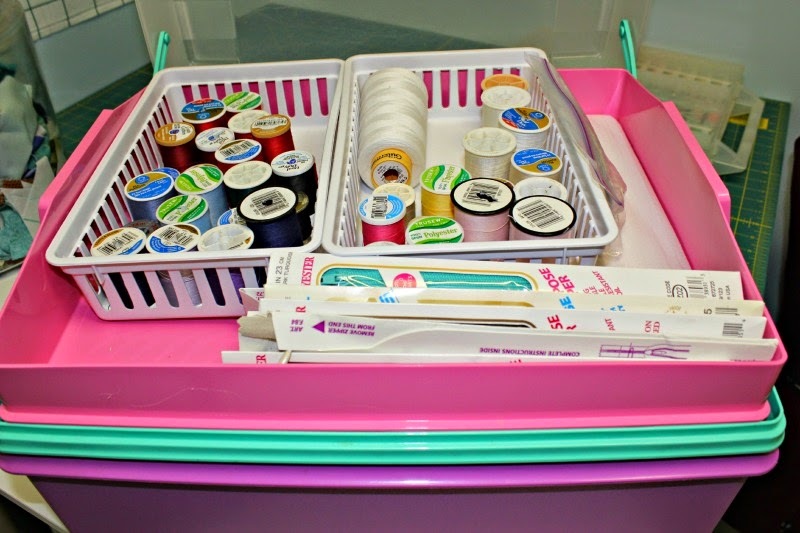 Now for the projects: I consider WiPs something that I am actively working on…you know, it’s physically out and on the sewing table, knitting needles, etc. Then I have those Unfinished Projects (UFOs), items that were started and somehow got lost. I am going to include a list of those as well. This is the last month. We are finishing our border blocks and assembling the quilt top. If you would like to be reminded what this is all about, click here. Our campaign started on Memorial Day and will run through Veteran’s Day. I have completed two liners so far, the third is on the needles. 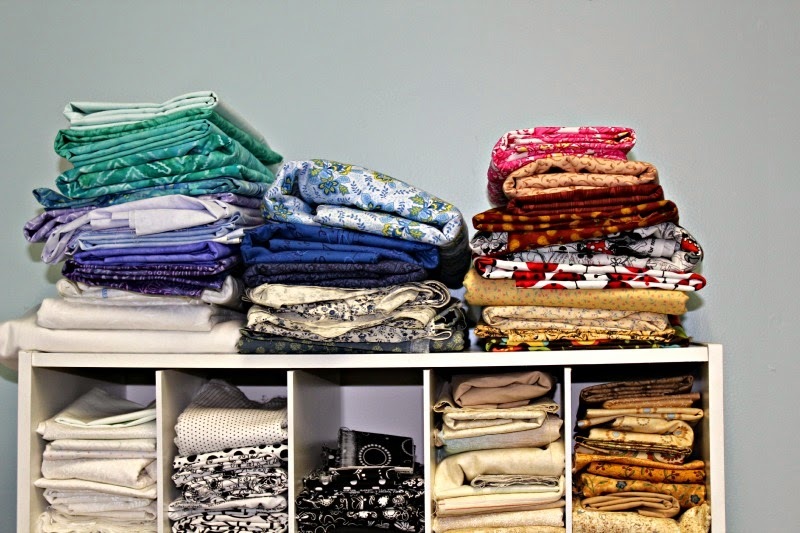 I just can’t seem to get those rows sewn together…it is taking me FOREVER! All my fault…this was a great sew-along. The quilt, shams and throw pillows are all complete. I used a different method for attaching the binding and I HATE strongly dislike it. So…the binding is coming off to be re-attached correctly. Needs to have its binding re-attached…this should have been a lesson. One piece has been stitched. This was a BOM from Little Miss Shabby. Some blocks have been hand-embroidered…most have not. 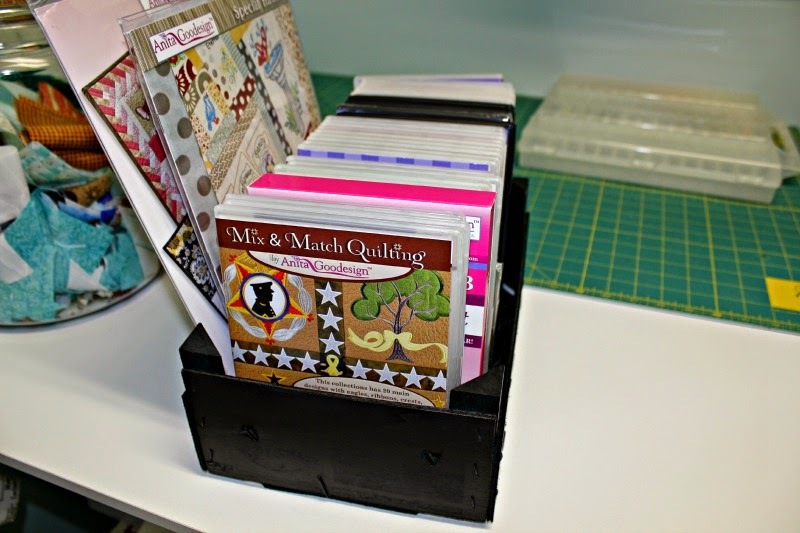 LQS turned this into a block of the month…six months complete. Since I no longer own the sewing machine, I would like to finish this for the new owner. Block #1 out of 13 complete. This is by no means a list of everything I want to make but a list of projects that I actually have what I need to get started. That’s it for the first two days.